This CD is published by the Swiss company Disques VDE-Gallo as part of its collaboration with Archives Internationales de Musique Populaire, based in the Museum of Ethnography of Geneva. 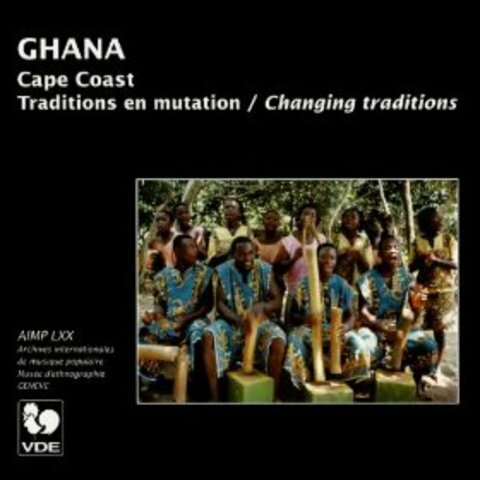 It comprises my original recordings from Cape Coast, Ghana, and links with my previous recordings of Dagara music (‘Bewaare - they are coming. Dagaare songs and dances from Nandom, Ghana’, PAN RECORDS 2052CD, 1996, and ‘Western Sisaala music from Lambussie, Ghana. In the time of my fourth great-grandfather…’ PAN RECORDS 2065CD, 1998). The CD focuses on the musical responses of local people to changes in their environment and the circumstances under which traditions are maintained, transformed or created. It is published with an accompanying 36-page booklet of my detailed notes (with French translation). These and the previous recordings cited above were made as part of an enquiry into the extent to which music is transformed by people in new locations or in response to changing circumstances. The Dagara people in Cape Coast are closely linked with their main location in NW Ghana, and the recordings examine how their music is changed in the new location of Cape Coast, 900km south. The CD also compares the Dagara people’s responses with those of other local (Fanti) residents who have adapted to changing situations in different ways. Publication of the CD was solicited in response to my invited contribution to the Conference on Applied Ethnomusicology organised by the Fondazione Giorgio Cini, Venice, 1-3 February 2003.